After making the house for my Mermaid pop-up book in the last post, I was inspired to create other types of houses. So thanks to Google and Pinterest I discovered Glitter Houses - also called Putz Houses - and oh my gosh I am so inspired! 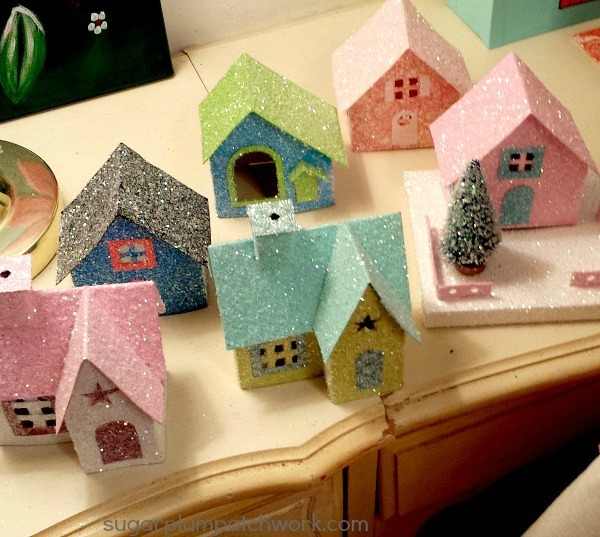 These houses are made from cardboard, then painted and covered in glitter! Glitter! I've been busy constructing enough for a village so needless to say my studio is covered in glitter, too. I have a total of ten little houses so far. There is an interesting history to these houses and some people collect the vintage ones. They were very popular in the first half of the 20th century. This is a great link to a brief history of these little houses. My project with these houses is for a Christmas Village. These houses are small - 3 to 4 inches tall/wide in most cases. They go on a base - you can see one in this photo, and then they are embellished with bottle brush trees, miniature animals/people, ribbon, beads - whatever your heart desires. I am using patterns designed by Howard Lamey at Little Glitter Houses. He has patterns and instructions on his site so check it out if you are interested in making your own. It's been a great way to learn and my head is now spinning with ideas for making my own house designs/patterns! 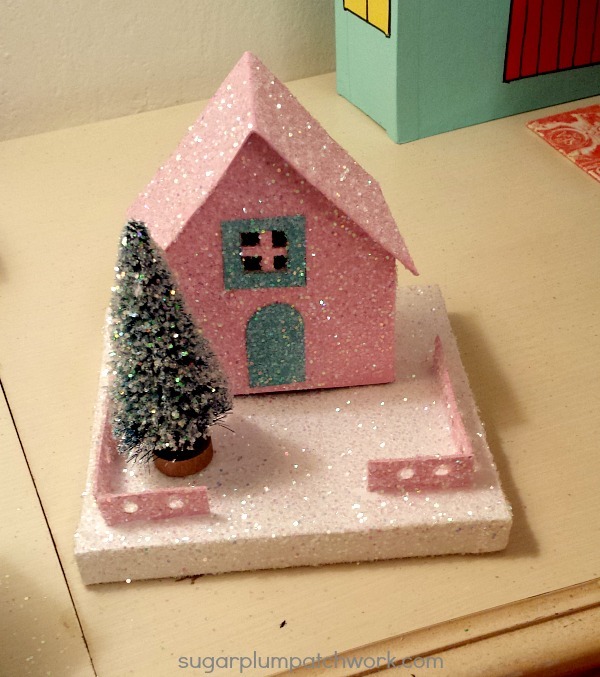 Little pink glitter house in progress. This house is not attached to the base yet - still in progress. Instead of using Howard's base tutorial I used this tutorial from Rhonda at Christmas Notebook. It gives a nicely finished product and is simple to make. Thanks Rhonda! Since I am making a whole village this project is ongoing! I will plan to share more pics soon. And I'll try not to get glitter on you! Update 7/28/16: This house is now finished and you can see it here. OMG, the are wonderful! Love that glitter ♥ makes me want to go dreaming away!! First, I want to thank you for your kind comment on my blog. Second, your houses are beautiful. They will make a wonderful village. You've done a great job making these shiny little houses. Hello Lucy and thank you!